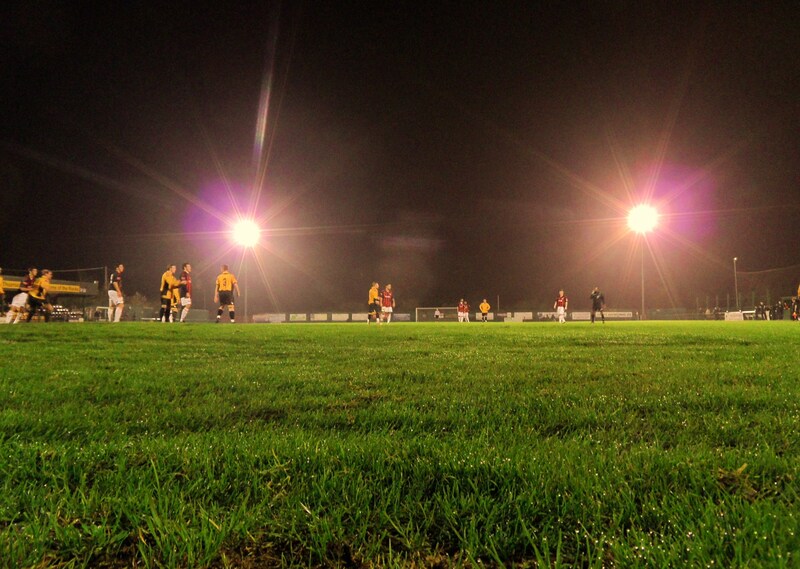 Can you think of anywhere better to spend a Tuesday night than in Thurrock? We are not talking about Lakeside, Thurrock here, with its huge cathedral worshipping the credit card gods, nor the Thameside Thurrock with its container ships bringing exotic cargos from all over the world. Oh no, we are talking about East Thurrock, or to be more precise, Corringham. During the second world war this was a very important place as it was home to the Kynoch munitions factory. For those train enthusiasts amongst you, you will also know it was once the location of the Corringham Light Railway that opened 1901, running from the village down to the Thames, a distance of nearly 3 miles. It closed in 1952 and with it one of the links with the outside world. But the small settlement of just 9,000 has given us more of a famous sight. DVO for those in the know, or for those not, Denise van Outen. Originally she didn’t have a “van” in her name, but in honour of the noble tradition of the men of Essex, she adopted that when she started to make her name in the limelight. Whilst few will remember that she originally hit our screens in 1996 as a weather and travel reporter on The Big Breakfast, even fewer will know that as a 17 year old she had a relationship with Gary Glitter! Every year the locals celebrate the work of DVO and what she has done for Corringham by going out on a Friday night, dying their hair blonde and “oranging up”.. So why was I here on a school night then? Well, Lewes were in town and with the young, free and single Lewes Lunatic Fringe on the prowl (ok – aging, tied to debt and arthritic) all those Stanford-le-Hope DVO wannabes wouldn’t know what hit them. 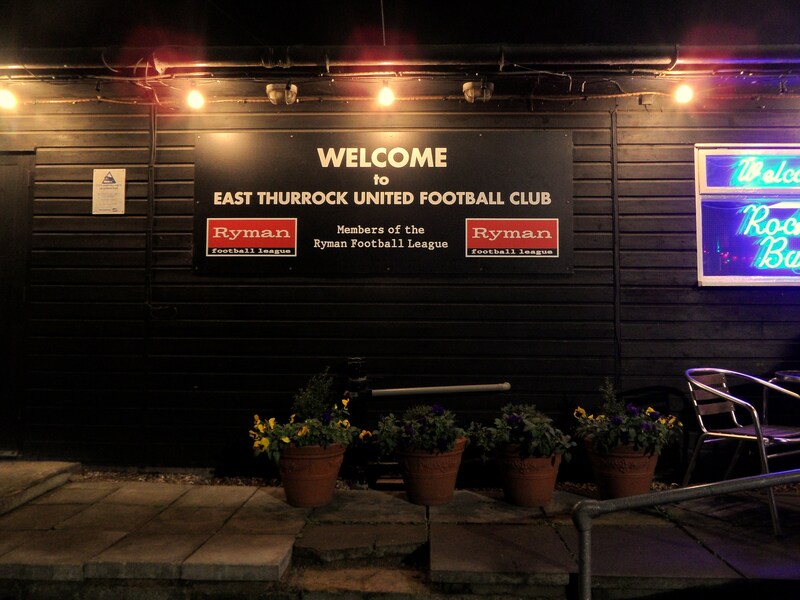 We were here to see the local heroes East Thurrock United host the mighty men of East Sussex. So to say this was a must win game for the Rooks would be an understatement. 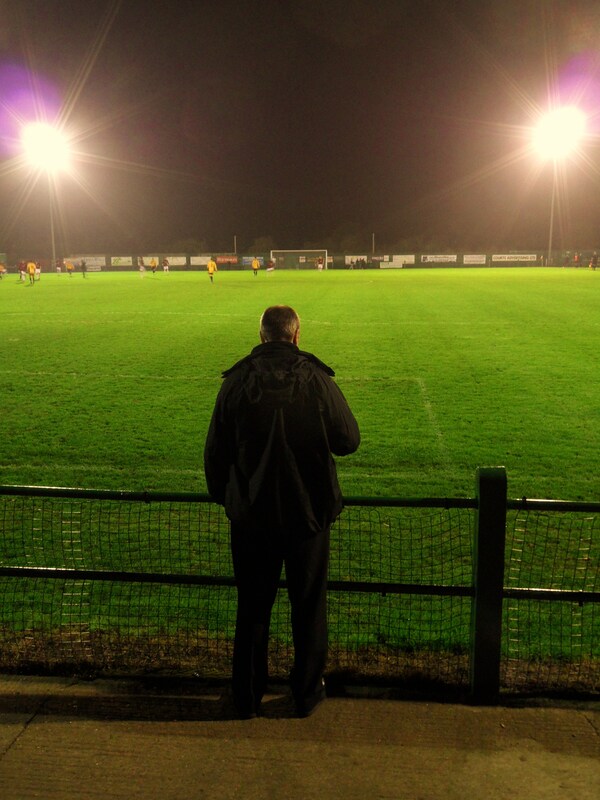 A dip in the high standards Steve King had set had seen only two points from the previous two home games, and whilst the Rooks were still holding a play off position, teams such as Lowestoft, Billericay and Hornchurch were starting to open a gap. East Thurrock had done superbly well in the cups this year, reaching the first round of the FA Cup for the first time in their history before losing last week to Macclesfield Town, and were still in the FA Trophy. But in the league they had struggled to adapt to life in the top league of the Rymans after they won promotion last season. Coming into the game they propped up the rest of the table and so it was essential that Steve King got the Lewes team hungry for victory. After this game Lewes would be travelling to Leatherhead on Saturday, who were also in the relegation zone. Three points were a must for the few visiting fans who had made the difficult journey into the Essex wilderness. Rookery Hill is a great non league ground. It has been home to the club since the 1980’s when thanks to the assistance of the local council and brewers Greene King they purchased the land where Rookery Hill today sits. The approach to the ground is very middle England. Picturesque church, next to a decent pub and small country lanes. It is only the burning gas towers just over the tree tops that gives away the nature of this area. But after we parked outside the Bull Inn with the smell of burning leaves, liniment and spray on tan in our noses we headed across the road and into the coliseum ready for the battle to commence. 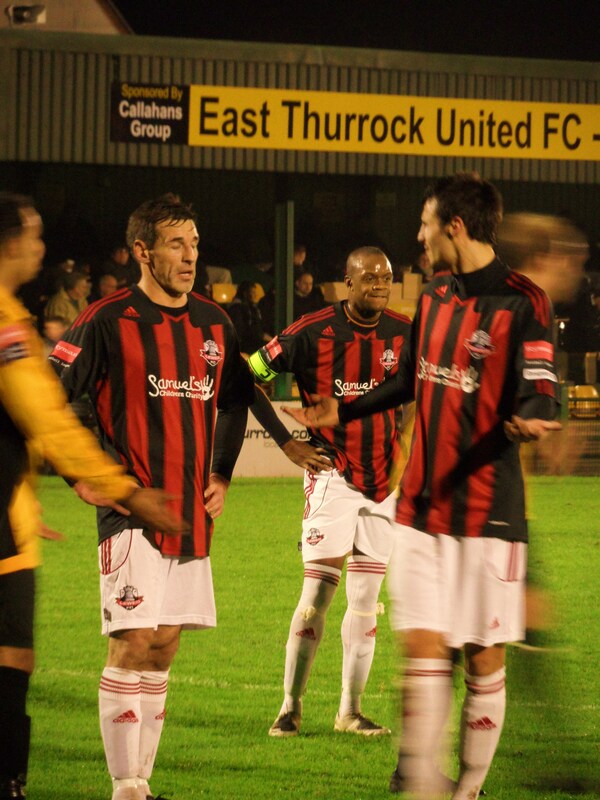 East Thurrock United 1 Lewes 0 – Rookery Hill – Tuesday 22nd November 2011 Did I say battle? This was more like a duel with white gloves being slapped around each others faces. Let’s just say it wasn’t a classic. In fact for the fifteen or so Lewes fans in attendance it will fade into the background rather quickly. The manner of defeat to a team at the bottom of the league was concerning enough without factoring in a fifth penalty conceded in just six games. Ultimately it took until the 92nd minute for this game to be decided when Kris Newby’s spot kick hit the back of the net, but for vast periods of the game it was pretty unforgettable. After a swift half in the empty Rocks Inn (get the copyright police on that straight away), we headed into the ground to see Lewes lining up with four attacking players in the starting eleven, including Albert Jarrett, a player capped seven times by Sierra Leone, and having a Premier League appearance under his belt from his days at Watford. Lewes certainly started with some good attacking intent. Draycott and Booth both had chances to put Lewes in the lead although the best chance was actually a mis-hit Malcolm cross that hit a bump in the area and flew up, fooling the keeper and missing the bar by a whisker. “Had it covered” joked the keeper to our friendly banter. (Reason to love Non League football number 321 – keepers who love a bit of banter with the crowd). 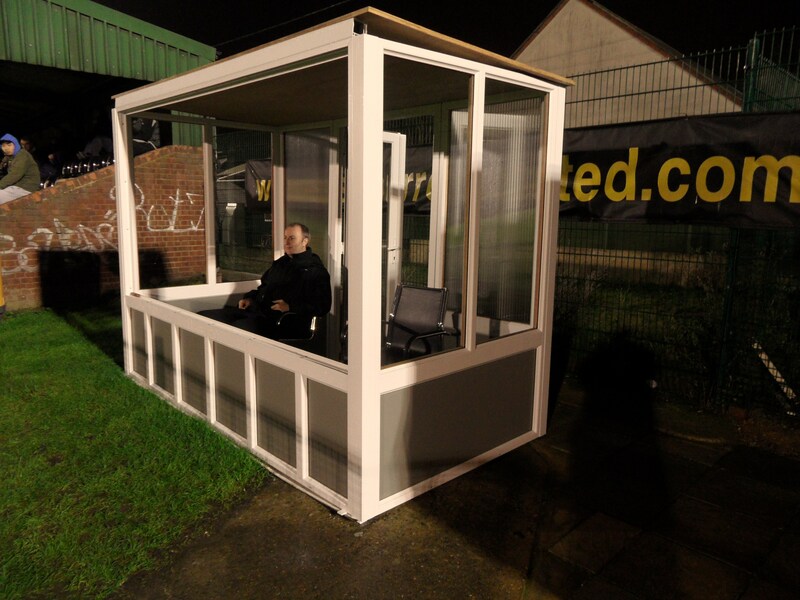 After the break Deaksy refused to come out of his Executive Box, which he now brings to away games in a holdall, focusing his gaze on the Champions League games on his portable TV rather than the fayre on offer on the pitch, and few could blame him. The ball seemed to be stuck in the midfield third with players diving all over the shop. Even the appearance of Christian Nanetti could not lift the mood, which seemed as dark and damp as the fog drifting over the ground from the Isle of Grain. With the game heading for another draw, Thurrock’s Kris Newby smashed the ball against the bar from distance. The ball hit the underside of the woodwork and bounced down. As with all such shots the players automatically react as if the ball crossed the line (unwritten rule of football no.343) despite the fact it was miles away. However, Newby was to have the last laugh when, as soon as the 4th official’s board went up (technically it was the female physio but that doesn’t sound as impressive) there was a push in the area, the linesman gave a spot kick and Newby dispatched the ball into the net. With time almost up I did manage to claim a small victory of my own. I completed my hatrick of ball touches, edging Deaks out 3-2 in a nail biter. Wolfie would be so jealous. The why’s and wherefore’s can be asked all night. We know that Steve King was deeply unhappy with this performance, yet the Rooks someone retained their fifth spot despite only taking five points from a possible fifteen so far in November. The only consolation was that 33 minutes after the final whistle I was back at TBIR Towers with a cup of tea and the love of a beautiful woman. But don’t tell CMF just yet.